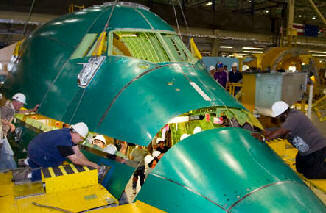 June 15, 2010– Boeing began fuselage assembly of the first 747-8 Intercontinental at the factory in Everett, Wash. Mechanics loaded panels for the 31-foot, 8-inch (9.6 m) long front section of the new airplane into the assembly tool. The panels are part of section 41, the area of the fuselage that houses the flight deck on the upper deck and the forward passenger cabin on the main deck, an area that most airlines typically configure with first class seating. The 747-8 Intercontinental is the new, high-capacity 747 that offers airlines the lowest operating costs and best economics of any large passenger airplane while providing enhanced environmental performance. Boeing has 109 orders for the 747-8 -- 33 for the 747-8 Intercontinental and 76 for the 747-8 Freighter. The first 747-8 Intercontinental is scheduled to deliver in late 2011. The passenger version, named 747-8 Intercontinental or 747-8I was launched on November 14, 2005. The aircraft will be capable of carrying up to 467 passengers in a 3-class configuration over 8,000 nmi (15,000 km) at Mach 0.855. The 747-8I will carry 51 more passengers and two more freight pallets with 26% more cargo volume than the 747-400. Despite initial plans for a shorter stretch than the freighter model, the two variants will be the same length, increasing passenger capacity and allowing easier modification of the 747-8I to freighter use. The upper deck will be lengthened on the -8I. New engine technology and aerodynamic modifications will allow longer range. Boeing has stated the 747-8I will be quieter than the 747-400, 16% more fuel efficient than the -400 model, offer airlines trip costs which are nearly equivalent with its predecessor's, and seat-mile costs 13% lower than the -400's. For the 747-8, Boeing has proposed some changes to the interior layout of the aircraft. Most noticeable will be the curved stairway to the upper deck and a more spacious main passenger entrance. The 747-8's main cabin uses an interior similar to that of the 787. Overhead bins are curved, and the center row is designed to look as though it is attached to the curved ceiling, rather than integrated into the ceiling's curve like on the 777. The windows will also be of similar size to the type used on the 777, which are 8% larger than those on the current 747-400s. The 747-8 will feature a new solid-state light-emitting diode (LED) lighting system, which can create mood lighting. LED technology also offers improved reliability and lower maintenance costs. Further down the aircraft, it has been proposed to place cabin-accessible facilities in the "crown" area, the space above the passenger cabin, currently used for air-conditioning ducts and wiring. The wiring and ducts will be moved to the side to create extra space; as a consequence, this area will not have windows. The added space can be used for galleys and crew rest areas, freeing up main deck space for additional passenger seating. During the initial 747-8 marketing phase, Boeing also proposed creating a revenue-generating "SkyLoft" passenger facility in the crown space. This facility would include "SkySuites", small individual compartments with sliding doors or curtains, featuring beds, seating, and entertainment or business equipment. A common lounge area could also be provided. Boeing also proposed smaller, more modest "SkyBunks". Access to the crown area would be via a separate stairway at the rear of the aircraft. Passengers using the SkySuites, sold at a premium price, would sit in regular economy class seats for take-off and landing, and move to the crown area during flight. However, pricing feasibility studies found the SkyLoft concept difficult to justify. In 2007, Boeing dropped the SkyLoft concept in favor of upper-deck galley storage options, which were favored by the airlines. Outfitting the crown space for sleeping remains an option on VIP aircraft. The first order for the 747-8 Intercontinental was placed by an undisclosed VIP customer in May 2006, widely believed to be a Middle Eastern head of state. Lufthansa became the first airline to order the 747-8 Intercontinental on December 6, 2006. In December 2009, Korean Air announced the order of five 747-8Is. Boeing announced on May 8, 2010, that the company had begun final assembly of the first 747-8I. Boeing stated firm configuration for the -8I was reached in November 2007. Major assembly of the -8I began on May 8, 2010. Two 747-8I aircraft are planned to take part in the 747-8I flight test program, the first destined for a VIP customer and the second for Lufthansa. First delivery of the 747-8I is planned for the fourth quarter of 2011.